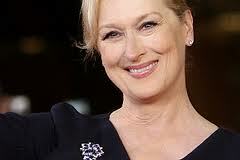 This week's beauty is my favorite actress Meryl Streep. God I love her. I have always loved her. Turning 62 on June 22nd, Meryl's talent, and natural, ravishing looks are allowing her to act circles around her over botoxed, frozen-faced peers in her golden years. Meryl's next film out is The Iron Lady in which she plays British Prime Minister Margaret Thatcher. "In our business, I think the attention that's given to how you look is cruel and unrealistic. The people in the audience will accept much more than the people who run the film studios will. I feel blessed to have my life. Besides, I have friends who are dead already, so why would I complain about getting older? We devalue ourselves, and we really have to stop that." Below is a clip of Meryl from 2006 with one of my other favorite people, Ellen. She is my favorite actress! She is a beauty through and through! I love both Meryl Streep and Ellen. I love that Meryl is so graceful and so beautiful naturally. Thanks for sharing this!